Hello Friends, I hope your Holidays were filled with family and friends and oh, let’s not forget all the of fantastic food. Man, if I don’t see another sugar cookie till the next holiday season it will be too soon… Don’t get me wrong, I’m a lover of the sweeter things in life just like the next fella, but when everyone you know shows up to dinner with those round tins full of cookies you know, they will break them out right after dinner and BAM your off to the races. This year was entirely different for me because in years past I would be here just long enough to spend Christmas with my family and then quickly head back on the road to finish out the year. But not this year. I got to spend some great quality time reminiscing with friends I hadn’t seen since high school about the good old days when all we really worried about was having enough money for gas and which girl we were gonna ask out that weekend. My how things have changed. In all those travels down memory lane I realized that the golden nugget of my timeline is that I have friends all across the United States that have touched my life; I also like to think I’ve had a positive effect on theirs as well. After all, isn’t that what they say, “the greatest gift is Friendship’’. 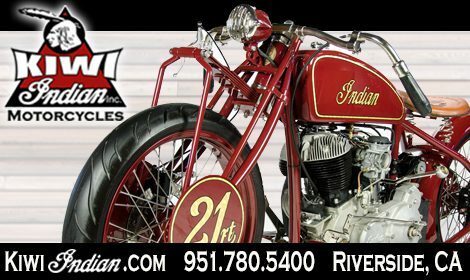 During the holiday season, I was asked by my pal, Krystal Hess, to stop by Voodoo Vintage here in Austin Texas, makers of frames and front ends for Import and American motorcycles. 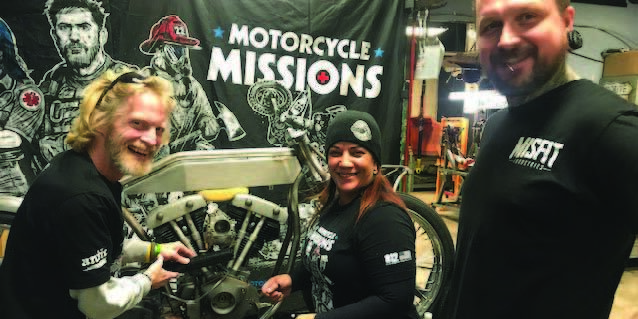 Krystal heads up a nonprofit organization called “Motorcycle Missions” that help Veterans and First Responders with PTSD find hope and healing through motorcycling. This was the first I’ve heard of this organization and was very honored and excited to see what they had going on. When I arrived, I was greeted by Krystal who made me feel right at home and wasted no time introducing me to Dave, owner of Voodoo Vintage, and all the amazing men and women who were veterans and first responders. 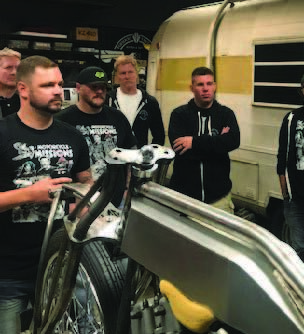 These men and women, under the guidance of Chris Moos from Misfit Industries and Dave from Voodoo, are given hands-on experience learning the ins and outs of bike building. 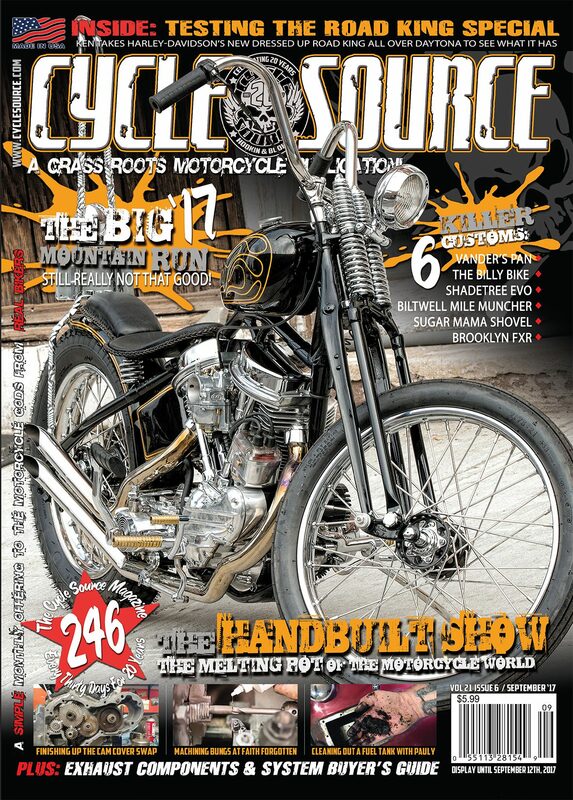 Kyrstal, Chris, and Dave teach them everything that a ground-up custom bike build requires. The night I was there the crew was busy mocking up the exhaust using one of Chris’s fantastic systems. I have never seen such a bitchin’ and flawless way to create an exhaust from scratch. I stood and watched with amazement as a veteran, who hours earlier had no concept of how to build an exhaust, created a set of pipes. I had several excellent conversations with the other men and women who share the same love and passion for Motorcycles that I have. Being able to connect with complete strangers, who day in and day out place their lives on the line so that we can be safe and free is a feeling I will never forget. Watching the joy in their eyes as they connect with not only the machine but other humans, made me feel a bit of shame that sometimes I take for granted the blessings and talents I have. Let’s just say the little time I spent with those folks had a very lasting impression on me and I walked away from that experience with a whole new perspective on a great many things… Thank You, Krystal, Chris, Dave and all the Veterans and First Responders I met that night. You have helped me look at life through a fresh pair of glasses. 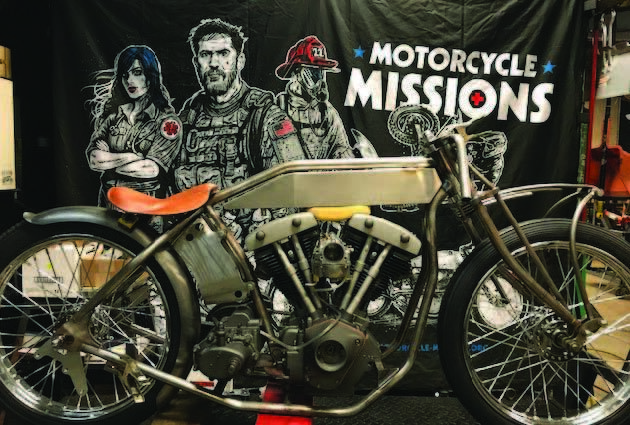 If you want to learn more, keep up with or better yet support the mission check them out at motorcycle-missions.org Until next time Brothers and Sisters be kind to one another and ride safe…God Bless X. 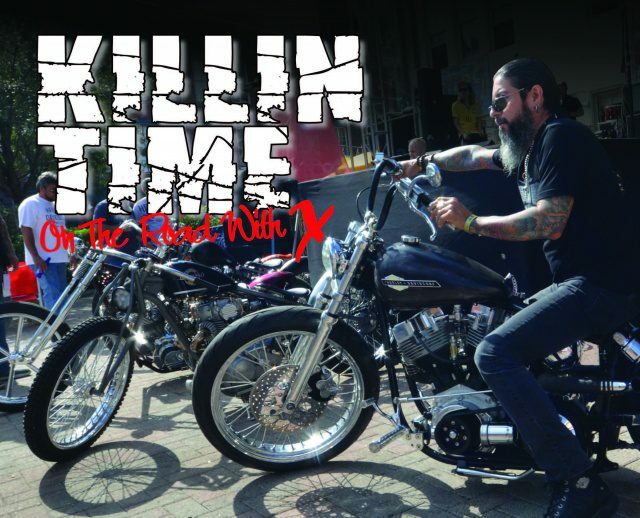 This entry was posted in Lifestyle and tagged Back Issue, Cycle Source, Cycle Source Magazine, Killin Time: On The Road With X, March 2018, Motorcycle Missions, Voodoo Vintage, Xavier Muriel. Bookmark the permalink.